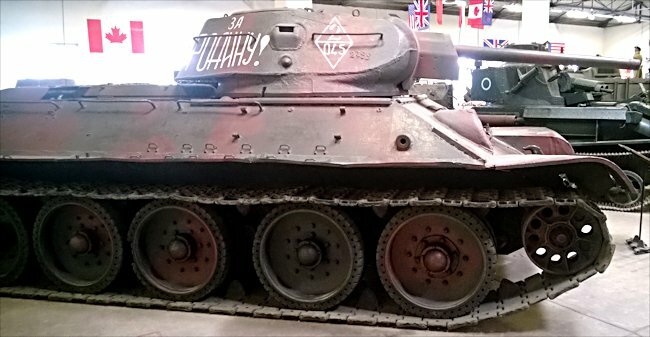 This T-34/76 Soviet WW2 Medium Tank can be found at the French Tank Museum in Saumur in the Loire Valley. The Museum is called Musée des Blindés ou Association des Amis du Musée des Blindés, 1043, route de Fontevraud, 49400 Saumur, France www.museedesblindes.fr . The word Blindés means armoured. It arrived at the Museum in 1968 having been stored at AMX Satory in France. It is believed that the Germans captured this tank during WW2 and sent it to France to be studied. German tank crew member Lugwig Bauer was back with his old regiment having recovered from wounds he received when his Panzer II tank had been blown up by a Soviet KV-1 the previous year. The regiment had now been equipped with Panzer III medium tanks. In 1942 they were mainly equipped with a short barreled 50mm L/40 main gun. This was ineffective against the frontal armour of the T-34/75 and KV-1 Soviet tanks. A few of the Panzer III tanks were fitted with the more effective long barreled 50mm L/60 cannon. The Soviet T-34 tank was considered by many as the best tank of the Second World War. Unlike the German panzers the T-34 was not a complicated machine to build and could be massed produced in vast numbers. 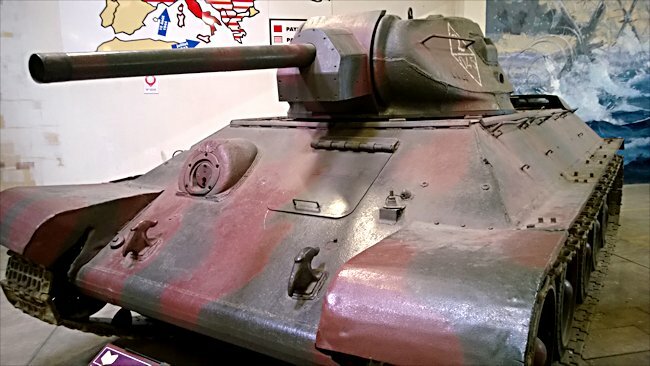 It was armed with a 76mm main cannon and protected with 45mm of slopped frontal armour. It was fast and had wide tracks to help it cross country in boggy conditions. 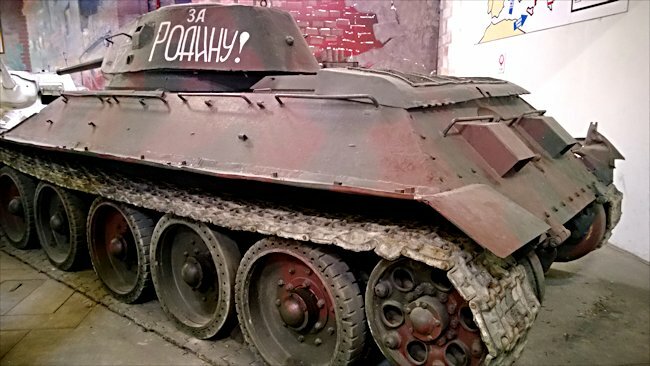 "They said we had to let the Soviet tanks come closer to us and then try to shoot them. Our problem with the Panzer III remained the same as the Panzer II, we could only fight the Red Army tanks at close range because our cannon’s performance was not good enough. The T-34 was a good tank. We certainly had a lot of respect for it." "During the battle of Voronezh as part of the 1942 spring offensive ‘Case blue’ we entered the grounds of a large castle like property that probably belonged to a Russian Earl. We expected to get some rest. We had been fighting for days. Suddenly in the morning we had an alert. Before we could get all our kit together the park was full of Russian T-34/75 tanks. We got into a tank battle." "Some T-34 tanks were moving from our left to right. They were exposing their weaker side armour that our guns could penetrate. Our gun sight optics are fitted with a big aiming spike that looks like a black triangle. To the left and right are smaller triangular spikes that helps fine the right deflection for moving targets. 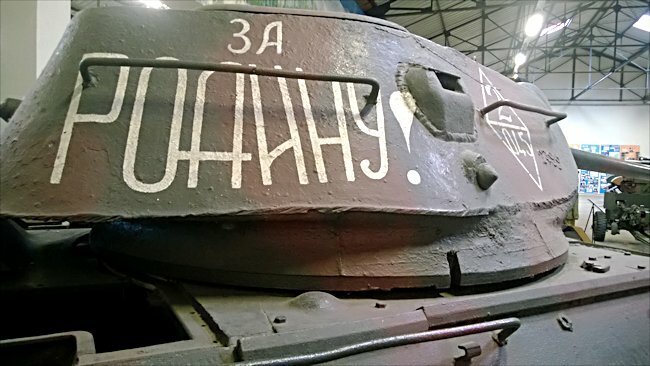 We shot seven Soviet tanks"